Halfway down the trail on the Murray Run Greenway, smack in the middle of the woods, there’s a single park bench. As far as I know, it’s the only bench located in these woods, and I’ve done a lot of thinking and dreaming there since we first moved to the Star City three years ago. But today, I brought my little dog with me, lay down flat against the slats… and I did nothing. 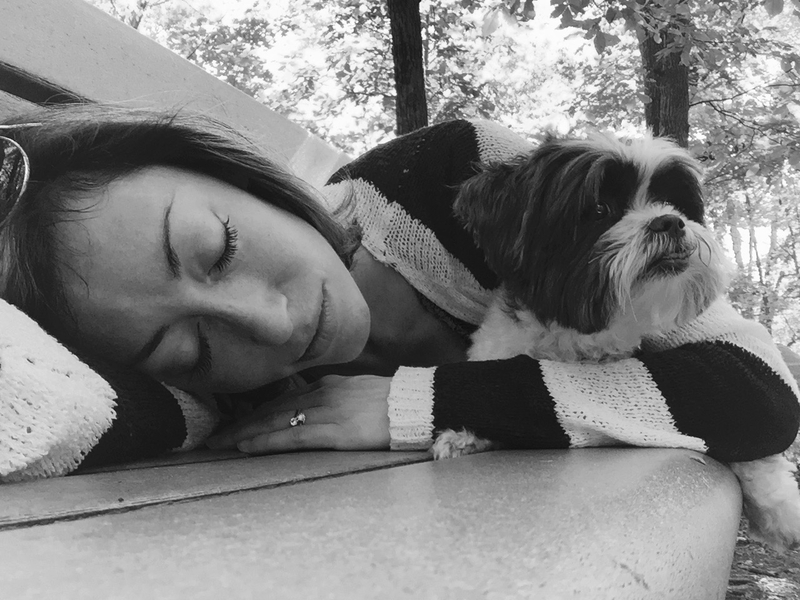 I closed my eyes for a little while, my arm crooked around Sophie’s furry neck, and I let myself breathe in the scents of autumn. Let the leaves flutter over me and land in little pools on the earth. I’m sitting here looking at it now, seeing, in the furrowed plane of my forehead, the cares of the day … But also, I see those cares melting, little by little. Today, I’m wishing you a little quiet corner of the universe where your soul can be at rest … whether it’s a park bench or a a favorite wing chair pushed up against the window. A boat, an open trail, or a garden, soaking in the last of the warm light. I would be at rest….with a pet dog!!! I want one so bad! I grew up with a lovely pup named Jasmine, a bright and energetic border collie/black lab. I miss her dearly. I spent the day yesterday looking at puppies. Hopefully one day soon, I’ll take the plunge and adopt. I truly hope you take the plunge… Sophie has brought so much sunshine and laughter into our home every day since the day we adopted her … I truly can’t imagine life without her now!! She’s my hiking buddy and my little fashionista (yes, I’m one of *those* people — I do, in fact, dress my dog, ha!). And if I ever have a bad day and need a good cry, she is the single most comforting creature I know. P.S. Sophie is (mostly) shih-tzu, & I can’t say enough good things about the breed, if you’re looking. 🙂 Such happy, loving, low-maintenance little lapdogs. Pure charm! I don’t know much about Boston Terriers, but I just had to tell you how much I loved our neighbors’ doxies, who lived with us for awhile when the neighbors were in the middle of a big move… Such ferocious tenacity … They made me laugh *constantly* with all their displays of bravery, machismo and loyalty … They were like tiny bodyguards or bouncers, always strutting around demanding to be taken seriously. 🙂 We ladies could use a companion like that now and then! Omg! They sound so cute!!! I really miss having a dog – especially one with personality! I find little dogs really make up for their small stature with their giant attitudes!